1911-97 bushing or Pro Package first? So I haven't even shot my new to me 97 BD yet (range today), but I'm already planning on some upgrades. No way can I have CGW do the full E conversion, too big a bite at one time, and besides, I prefer doing my own work. So I'm planning on the DIY Pro Package, and just sending in my slide and barrel for the bushing conversion. Question is, which one first? This pistol will only be a range toy, little if any carry other than range and back, and probably not even HD, I have high cap 9's with rails that are a better choice. So accuracy and trigger will be the priorities. So that said, has anyone done just the bushing on an otherwise stock pistol, and if so, how much difference in accuracy did it make? 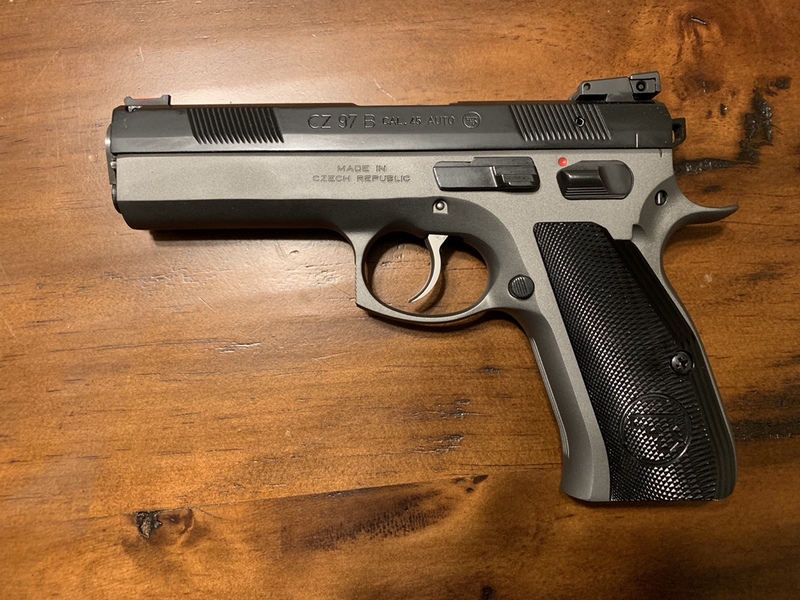 Haven't checked pull weights on this trigger yet, it feels pretty good, but it's heavier and creepier than either my P07 or PCR, especially in DA, no surprise. I don't think the trigger will have much impact on my shooting it, but it should be an interesting range trip. 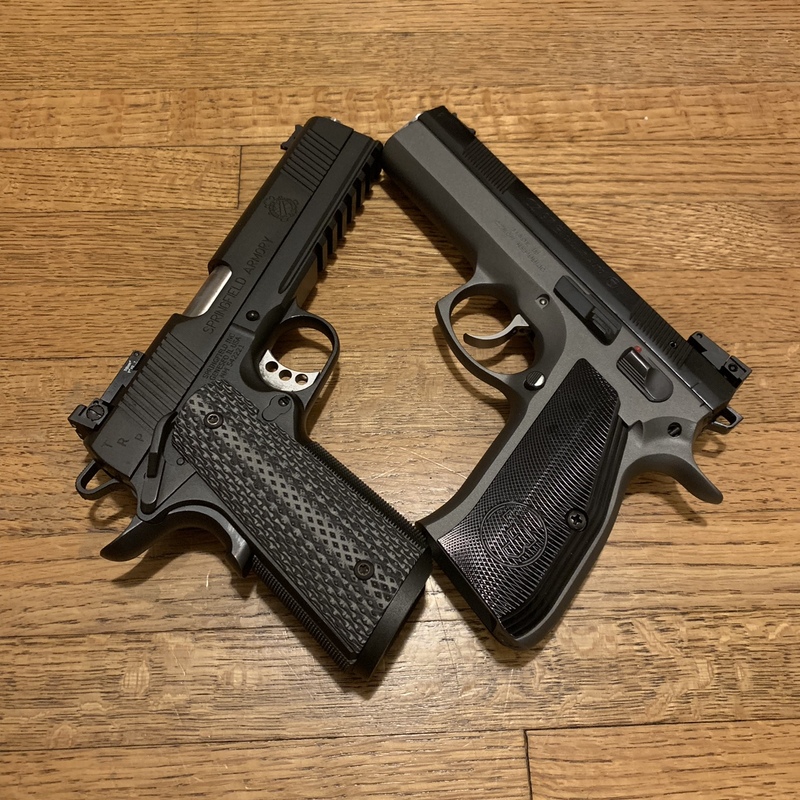 I plan on shooting it against my 1911 and the PCR, the former because, to date, I shoot it the best of any of my pistols, and the latter, just because I want/need to shoot it more, this'll only be my second range trip with it. Will probably take the P07 as well, it's got the best trigger of any of my guns, even better than the 1911. More later, and thanks for any info. 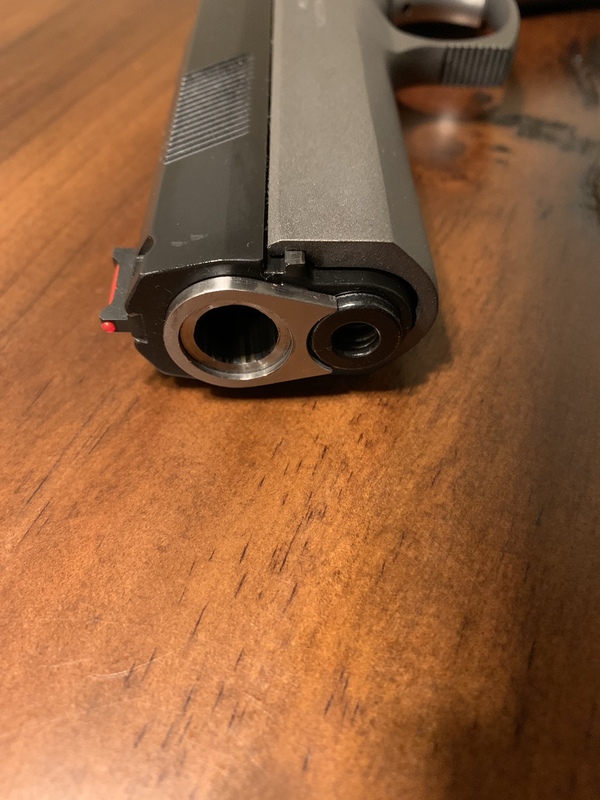 Re: 1911-97 bushing or Pro Package first? So I got it to the range yesterday, which pretty much answered my question. Was going along, fat, dumb, and happy, until I switched from the 97 to my PCR. For about half the first mag, I was getting unintended double taps, which tells me the 97's trigger isn't nearly as light or smooth as my smaller CZ's. Accuracy is meaningless if you can't control it, so I think the first order of business will be some trigger work. So now my question is, Defensive Carry or Pro Package? I'm fine with the stock trigger blade, is there any other reason to prefer the Pro Package? Thanks. Here's a crazy idea, why don't you shoot it first? Did you miss my previous (second) post ? I got the full E conversion, and I love it. When I first got my 97B, I did feel that the trigger needed to be lightened a bit. After I got the work done, all of my friends with custom 1911s loved shooting my 97B. It is my favorite 45, and I have a number of them. I have found posts and blogs where people have done just the bushing upgrade and it improved the accuracy notably, worth every penny is the expression I have heard. That is the first mod I will be doing. Then the race hammer out and a few springs. Unless you're using it for competition that's really all you need. I did the pro package first and was very pleased with the results. 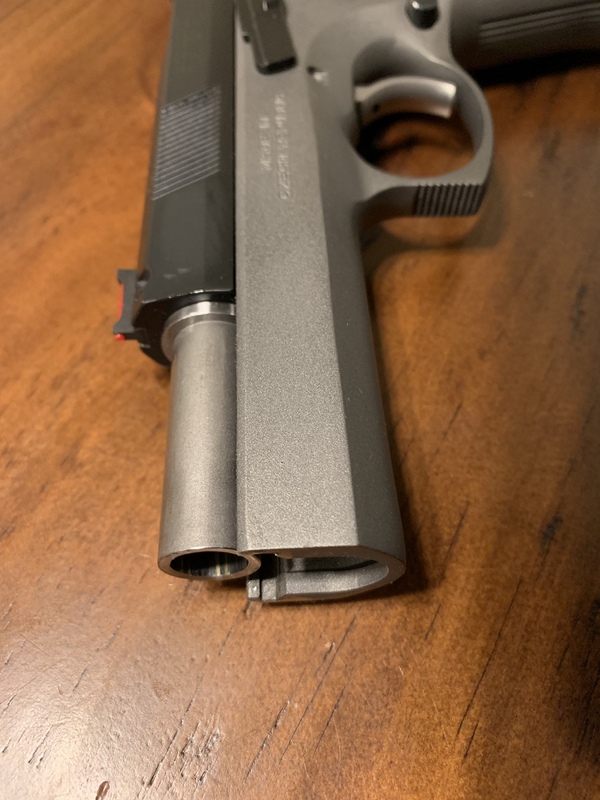 Initially, I didn't see the need nor could I understand how much better it could possibly get by adding the 1911 bushing. Boy was I wrong! It is by far my favorite pistol. You really can't go wrong on which you install first but Im glad I did pro package first. 1911 bushing was icing on the cake. For me it was nice to do it in to phases to get the feel of what each upgrade brings. That's exactly what I'm doing, I tore it down and polished internals this evening, will be reassembling and installing the Pro Package tomorrow. BTW, the CZ armorers manual is a worthwhile investment, even though it doesn't specifically cover the 97, the innards are pretty much identical to my PCR that I polished and replaced the trigger in yesterday. Will probably do the bushing eventually, but it's a good thing winter has arrived in my neck of the woods, I really need to stop spending money on guns for awhile . At least until I get a few things sold. Later.